With the America’s Cup moving into a new era of foiling catamarans, the debate between multihull and monohull has reached a new level. Traditional sailboat racing continues to be dominated by monohull designs, but multihull proponents are rapidly making inroads and demanding respect. Skipper Greg Alden and his crew aboard Irie struck a blow for the monohull world with an eye-popping performance in the 2013 Down the Bay Race. Powered by 20-30 knot northwesterly winds, the state-of-the-art TP52 completed the 120-nautical mile course in 7 hours, 2 minutes and 32 seconds. That blew away the previous mark of 11 hours, 9 minutes that had been established in 1974 by Running Tide, the Sparkman & Stephens 60-footer owned by Al Van Metre. Skipper Paul Parks believes his high-performance SeaCart 30 could cover the passage from Annapolis to Norfolk even faster if fortunate enough to race in similar conditions. Sundog, a 30-foot, carbon trimaran, has captured line honors in numerous major distance races and is certainly capable of challenging the new record when it competes in the 65th edition of the Down the Bay Race for the Virginia Cruising Cup, which begins May 23 near Thomas Point Light off Annapolis. Sundog has a proven track record – pulling off an impressive trifecta in major races on the Atlantic Ocean, Pacific Ocean and Great Lakes after Parks initially took delivery in 2011. The SeaCart 30 made its debut by capturing line honors then placing first in class and second in fleet for the Fort Lauderdale-to-Key West Race. Next up was The Border Run from Newport Beach to San Diego via Mexican waters and Sundog again took class honors on corrected time. Parks was particularly proud of placing first on both elapsed and corrected time for the prestigious Chicago-to-Mackinac Race. Parks estimated he has competed in the Down the Bay Race at least 15 times aboard his previous boats named Sundog such as a Tartan 10, J/35 and Farr 40 and has captured class honors in the past. Multihulls will receive a separate start in the Down the Bay Race for the first time this year and Sundog is among five such boats entered. Another notable entry is Wild Card, a Reynolds 33 owned by Tim Layne of Glen Burnie (MD) that holds the elapsed time record for the St. Mary’s College of Maryland Governor’s Cup. With just under a week remaining until the registration deadline, 30 boats ranging in size from 27 to 47 feet have entered the 65th Down the Bay Race for the Virginia Cruising Cup. Reindeer, a Morris 47 co-owned by Tony Parker and Peter Driscoll, is the largest entry and also one of the most historic. Parker and Driscoll were regular crew members aboard Reindeer when previous owner Newbold Smith sailed the classic offshore racer to significant success in events as Annapolis-to-Newport and Newport-to-Bermuda. Parker and Driscoll used the Down the Bay Race as a tune-up for Annapolis-Newport last year and that strategy worked out well. The Morris 47 posted the best corrected time for the Chesapeake Bay portion of the 2013 edition. Two class winners from the 2013 Down the Bay Race are entered again this year with Pterodactyl (Evelyn 42, Gene Thayer, Norfolk) back to defend its title in PHRF A1 and Anjalei (Catalina 387, Jim Forrester, Norfolk) looking to repeat in PHRF Non-Spinnaker. 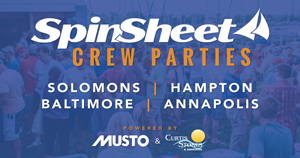 Once again, Storm Trysail Club-Chesapeake Station will host a welcome party for skippers and crews on Thursday, May 22 at Severn Sailing Association. As always, Hampton Yacht Club will conduct a spectacular post-race party and awards ceremony on Saturday, May 24.